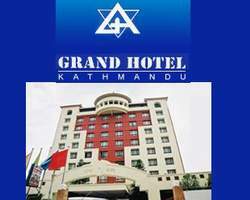 The Grand Hotel Kathmandu is located in the prime area of the city within walking distance to the Casino Nepal, Swoyambhu, business houses and shopping center. The Grand Hotel is ideally situated on a quite location within a mere 5 minutes walk from the Casino Nepal. The Grand Hotel Kathmandu is 12 storied modern building with a touch of traditional interior. The unique feature of Grand Hotel is- it is the tallest building in Kathmandu. Grand Hotel has well - equipped and well-furnished deluxe rooms and Executive suite rooms. Total 91 well appointed guestrooms, out of which we have 63 Twin rooms, 21 Double rooms and 7 executive rooms including 7 interconnecting rooms. A wealth of expressions in an inspiring selection of bed-sitter rooms. Quiet beauty that whispers elegance and taste softly. Grand Hotel Kathmandu is well furnished with Deluxe and Executive Suite Rooms . Being the tallest hotel in the valley Grand has 91 well-appointed guest rooms and 7 Executive Suite Rooms including 7 Inter Connecting Rooms. All the rooms in Grand Hotel are tastefully furnished with central heating and cooling system, multi-channeled television, International direct dial telephone from the room, telephone and hair dryer in the bathroom.Taking into consideration Grand Hotel Kathmandu guests safety and comfort, all the rooms and floors are equipped with smoke and fire detectors and fire fighting system. Check in 12:00 hrs and 12:00 hrs. All major credit cards accepted. The Restaurants at the Grand Hotel Kathmandu is sophisticated meeting places favored by the fashionable and the discerning where the city's high rollers can entertain and confer over the plates of impeccable cuisine. Experience the dining in the clouds by the light of the stars at the "Maharaja Restaurant" situated on the top most floor, whose authentic "Maharaja". Every view from Maharaja restaurant is like a picture postcard. an informal eatery with an European ambience, which is opened round the clock. "Superb attention to details creats a soothing blend of harmonious spaces and warm, effortless service"
Business Centre at Grand Hotel Kathmandu is equipped with every facility an executive on the move might require. Professional secretarial services, Personal computer, Sophisticated communications Fax, and Photocopier, Courier service. It provides every facility to expedite your transaction. And does so efficiently. For those who want to make business a pleasure and feel the right to make Corporate decisions depends on being at the right places, then Grand Hotel Kathmandu Banquet Diamond Hall and Golden Hall equipped with all conference facilities/amenities is the 'right' places. Grand Hotel Kathmandu Fitness Studio offers exclusive, excellent services to help you stay trim and good looking . Work up a sweat in the Gym/ Sauna/Jacuzzi or Steam Bath and let us take care of yours looks. The Swimming Pool facility is situated on the hotel premises overlooking a beautiful garden where you can sip a cool glass of your favorite drink or relax in the warm Kathmandu sun. Travel and Sight seeing assistance.